Meet IGTV, Instagram’s New Long-Form Video Tool! The now 1 bil­lion users strong social plat­form, Insta­gram, has a new fea­ture that may take large pieces of YouTube’s pie. On June 20th, 2018 Insta­gram announced the launch of IGTV. IGTV allows cre­ators to upload and share videos up to an hour in length, users cre­ate their own chan­nels, and Insta­gram plans to let cre­ators mon­e­tize their chan­nels in the future. This excit­ing new fea­ture of the Insta­gram expe­ri­ence cre­ates oppor­tu­ni­ty for busi­ness­es, how can IGTV help grow your brand? Kevin Sys­trom, CEO of Insta­gram, on stage at the June 20th launch event in San Fran­cis­co stat­ed “It’s time for video to move for­ward and evolve.” IGTV videos are opti­mized for mobile view­ers by play­ing videos in a ver­ti­cal for­mat and is acces­si­ble in the Insta­gram app and as a stand­alone IGTV app for both iPhone and Android users. Unlike pre­vi­ous Insta­gram video fea­tures, where length was lim­it­ed to 1 minute or less, IGTV videos can be up to 1 hour in length. Allow­ing for longer videos gives cre­ators more free­dom and means a lot more time can be spent con­sum­ing con­tent and keep­ing users in the app. There are cur­rent­ly no ads in IGTV but Sys­trom says that down the road they’d like to help cre­ators mon­e­tize IGTV and that they rec­og­nize the pre­mi­um oppor­tu­ni­ty for ads in IGTV. View­ers can com­ment on, heart, and even share IGTV videos with oth­er Insta­gram users. 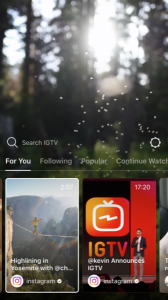 In IGTV you can browse videos cat­e­go­rized in tags labeled “For You” includ­ing videos Insta­gram believes you’ll enjoy, “Fol­low­ing” show­ing videos from cre­ators you fol­low in Insta­gram, “Popular” which is trend­ing videos, and “Con­tin­ue Watch­ing” where you can watch videos you’ve pre­vi­ous­ly start­ed. There is also a search bar where users can search for creator’s chan­nels, cur­rent­ly hash­tag search is not includ­ed in this search tool. If you’re already on Insta­gram you can eas­i­ly cre­ate your IGTV chan­nel sim­ply by click­ing the new IGTV logo, a tv with a line through it, in your Insta­gram app in the top right cor­ner of the news­feed tab or by down­load­ing the IGTV app. Click to cre­ate a chan­nel and then you’re ready to start post­ing con­tent! Con­tent is made in advance and then uploaded, cur­rent­ly video can­not be shot in IGTV itself. Videos have been a grow­ing trend in social media for some time now, so if you’re not cre­at­ing video con­tent yet it’s time to start! Video con­tent allows your audi­ence to get to know your brand bet­ter and if your con­tent is engag­ing enough they’ll keep com­ing back for more! We’d love to hear your com­ments and ques­tions below! As always, if you need help with any of your online mar­ket­ing, we’re just a click away. Since the Face­book algo­rithm is now giv­ing pri­or­i­ty to con­tent from Groups, local news sources, and oth­er places where Face­book users have “mean­ing­ful inter­ac­tions”, it is high time to con­sid­er using FB Groups to help increase those mean­ing­ful inter­ac­tions, and at the same time, build your brand. Groups are a way to build a com­mu­ni­ty based on a com­mon inter­est. Think about your business…What do your clients want to talk about? Groups pro­vide a space to com­mu­ni­cate about a shared inter­est. You can cre­ate a group for anything—your fam­i­ly reunion, your after-work sports team, your book club—but since we are in the busi­ness of grow­ing busi­ness­es, we’re think­ing more in line with: My Week­ly Busi­ness WIN, Ask a Sales Expert, Fit­ness for Fun, etc. There are a cou­ple of tricks to use for grow­ing a Face­book Group, so to aid in your efforts, here are six tips for increas­ing engage­ment in your Face­book Group. Believe it or not, closed Face­book Groups often fos­ter more engage­ment than pub­lic groups. Group mem­bers are more like­ly to post if they know that their post will only be seen by like-mind­ed indi­vid­u­als in the Group—not every­one in their Face­book feed. There’s also a sense of exclu­siv­i­ty in a closed Face­book Group. Hav­ing a closed Group fos­ters an intel­li­gent and respect­ful atmos­phere that encour­ages mem­bers to post. Since Groups tar­get a sin­gle com­mu­ni­ty, base your Group on a sin­gle theme that will inter­est your clients. Base it on a need. For exam­ple, say you own a music store. Make a Group for local musi­cians, not a Group about your store. Ask mem­bers to share their exper­tise. Let mem­bers par­tic­i­pate and get com­fort­able in the Group. Let it become a place where they find valu­able infor­ma­tion. Then, mix in pro­mo­tion­al posts lat­er on when the Group is estab­lished. What do your clients want to talk about? Clients don’t want to dis­cuss your music store. Rather, they want to dis­cuss gigs, equip­ment, and tips for copy­writ­ing orig­i­nal tunes. Then when a Group mem­ber needs a new micro­phone, or gui­tar, he or she will remem­ber that your store’s Group gave them great infor­ma­tion in the past. 3. But How Will Members Remember ME? Face­book lets you cre­ate Groups using your exist­ing brand­ed Page. Addi­tion­al­ly, your brand­ed Face­book Page will be adver­tised on the right-hand side of your Group inside of the “Group By” box. Your admin­is­tra­tors need to be active­ly engaged. Reg­u­lar engage­ment is key to keep­ing your audi­ence con­nect­ed. What’s the point of ask­ing ques­tions, if no one is there to pro­vide answers and reg­u­lar­ly engage with mem­bers? Ide­al­ly, we rec­om­mend hav­ing a week­ly series. Give mem­bers a call-to-action to encour­age them to join the con­ver­sa­tion. Admins could even ask Group mem­bers what they want to dis­cuss, to get the pulse of the mem­bers. Of course, be sure to use their ideas. Oth­er­wise, you will lose cred­i­bil­i­ty. Or have a series based off a FAQ, or a just-for-fun top­ic relat­ed to your indus­try. Final­ly, give the series a mem­o­rable title. EG. It’s Time to Ring the Cow­bell or Ten Cents a Dance. News Flash: Face­book is rolling out a series of new fea­tures aimed at those who cre­ate and man­age these groups, includ­ing cus­tomer sup­port with answers and help pro­vid­ed by a real per­son, not a machine or auto­mat­ed respons­es. Admins are also get­ting a ded­i­cat­ed online edu­ca­tion por­tal and more tools to man­age their groups’ posts. Cur­rent­ly they are in the pilot phase for admin sup­port that’s avail­able to a lim­it­ed num­ber of group admins on iOS and Android (but you know how fast things change). Make sure to include a Group descrip­tion and a cov­er pho­to. All groups, pub­lic or closed, are view­able pub­licly. Poten­tial mem­bers need an accu­rate descrip­tion of your group to decide if they are inter­est­ed. Also make sure to use a pho­to that will grab someone’s atten­tion. First impres­sions mat­ter, even on the web. Don’t for­get to wel­come your new mem­bers to the Group. This trick is more effec­tive than you’d think. Each week send out a wel­come post invit­ing peo­ple to say hi and intro­duce them­selves. Make it infor­mal, so new mem­bers feel com­fort­able to post, plus, it will encour­age exist­ing mem­bers to say hel­lo and get con­ver­sa­tions start­ed. Keep grow­ing your Face­book Group! To recap: Your closed group should have a description/photo that inspires poten­tial mem­bers to join. Once they join, be sure to wel­come them and have active admins that keep the group use­ful to its mem­bers. If you haven’t formed a group for your busi­ness, at least go and look at all the groups out there. Maybe join one. Once your feet are wet, you might want to form your own group. They are easy and an excel­lent way to engage your audi­ence and grow your brand. Need help? Please just reach out to us! In my per­son­al opin­ion, the num­ber-one thing that stops most peo­ple from pur­su­ing their entre­pre­neur­ial dreams is FEAR. Well, you know what I say?? F**k fear. (What??!! I can’t believe she just said that! Well, I did.) So many of us are fear dri­ven. We are mak­ing choic­es, big and small, not based on what we tru­ly want, but on what we are afraid of—what we’re afraid of los­ing, what we’re afraid of win­ning, the fear of work­ing too hard, the fear of not work­ing hard enough, the fear of doing it “wrong,” the fear of rejec­tion, the fear of what oth­ers think of us, the fear that we can’t do it, the fear that we can. Where in your life does fear stop you? Take a moment to look at your life and think about some of the things you REALLY want. How many of those things are you work­ing toward right now? How many are you not? What if I spend my time and I fail? What if I spend my mon­ey and I fail? What if I try as hard as I can and I fail? What if I succeed…then what?! What if he/she won’t love me any­more? I will expect xyz from myself. I don’t want to work that hard. I have too many respon­si­bil­i­ties to fol­low a dream. Hard­ly any­one gets what they real­ly want, what makes me any dif­fer­ent? What’s stop­ping you from going after what you tru­ly want in your life? I’d love to hear in the com­ments below! Get your copy now at JobsToJammies.com. The Life of an Entrepreneur…WHY BOTHER? It’s 6 AM. My alarm goes off, and I feel a famil­iar pit of despair in my stom­ach. I won­der if I con­tin­ue to press snooze for long enough, will I no longer need to go to work today? Alas, I must get up…shower, hair, make-up, suit. Cof­fee, cof­fee, cof­fee. I’m at the edge of late, so I’ll have to run to catch my bus. My heels are in my bag, as I run to join the oth­er tired drones on the bus. I ride for an hour to spend the day doing some­thing I do not love, with peo­ple I wouldn’t nec­es­sar­i­ly choose to spend time with if they weren’t in the cubi­cle next to me, to eat lunch at my desk, or I could go out, but it’s so stress­ful to get back in time for my meet­ing, and (errrrreeeccckk—this is the sound of squeal­ing tires as I halt this sto­ry). This isn’t my life…well, it’s not my life any­more. Today, I work at home in my PJs. Most days I wake up when I’m done sleep­ing. I exer­cise, make myself some deli­cious break­fast, write in my grat­i­tude jour­nal, and when I’m ready, I start work. My com­mute is 30 sec­onds, I don’t have any make-up on, my hair is in a pony­tail, I work with whomev­er I choose, focus­ing on projects that bring me joy and ful­fill­ment, and most of the time, I love my life. Hon­est­ly, I think the num­ber-one rea­son to be an entre­pre­neur in some fash­ion is, to quote one of my idols, Aretha Franklin, “Free­dom, oh free­dom, yeah free­dom, peo­ple say FREEDOM!” Please don’t mis­un­der­stand me and think I’m imply­ing that entre­pre­neurs don’t work. In my expe­ri­ence, entre­pre­neurs often work “hard­er” than many employ­ees. But the dif­fer­ence is that it’s in YOUR time, on YOUR sched­ule, with YOUR rules. The dif­fer­ence is that when my niece was born, I could take two weeks off to fly to Col­orado to be with her and my fam­i­ly. I didn’t ask for per­mis­sion, I didn’t take vaca­tion days, I just went. I per­son­al­ly am a work hard/play hard entre­pre­neur. When I work, I am dili­gent and focused and am con­stant­ly striv­ing to pro­vide more and more val­ue in the mar­ket­place and in people’s lives. When I don’t want to work, I don’t. I spend time with the peo­ple I love, I go on total­ly unplugged vaca­tions (no cell phone, no com­put­er), I take class­es, I go to hap­py hour, I go hik­ing, I read, I nap, I travel…you get the pic­ture. I would also like to take a moment here to talk about full-time vs. part-time entre­pre­neurs. If you want to ful­ly tran­si­tion out of a job you’re not pas­sion­ate about, you can absolute­ly do that. But even if you love your job, or you tru­ly don’t want to give up your job, you can still become at least a part-time entre­pre­neur in some form or fash­ion. Entre­pre­neuri­al­ism is not for every­one, but you won’t know until you try. The extra mon­ey and time free­dom it will afford you can be well worth the effort. Besides, you could find a new call­ing that might sur­prise you. 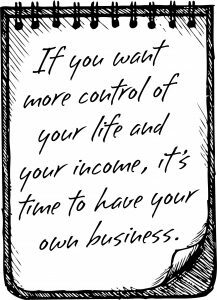 If you have a desire for more time and mon­ey free­dom, if you want more con­trol of your life and your income, then it’s time to have your own busi­ness. That is where more time and mon­ey free­dom come from. They cer­tain­ly don’t come from being a slave to a com­pa­ny or anoth­er per­son. Why do YOU both­er? What dri­ves you to be an entre­pre­neur? I’d love to hear in the com­ments below! This is an excerpt from Brid­get Brady’s #1 Inter­na­tion­al Best­seller, “Jobs to Jam­mies!” Get your copy now at JobsToJammies.com. A lit­tle birdy just told me we’re gonna’ get more out of 140 char­ac­ters! In the com­ing months Twit­ter is mak­ing changes to sim­pli­fy Tweets includ­ing what counts toward your 140 char­ac­ters! For instance, @names in replies and media attach­ments (like pho­tos, GIFs, videos, and polls) will no longer “use up” valu­able char­ac­ters. You’ll now also be able to Retweet and Quote Tweet your­self. These updates will be avail­able over the com­ing months. If you want to get more of the scoop, just go talk to that same lit­tle bird…I call her “Twit­ter”. Check back here for more updates in the com­ing months! If you have more info on this, or oth­er Twit­ter updates, PLEASE be sure to add a com­ment below! How Long Does Social Media Marketing Take? One of the ques­tions (or con­cerns) that I some­times get from my clients is, “How long will this take?” Like most peo­ple, when I want some­thing, I pret­ty much want it NOW. The real­i­ty is, social media takes time to grow and reach it’s full effi­ca­cy. It just does. We ALL wish it would hap­pen light­en­ing fast, and in a mat­ter of weeks we’d have thou­sands of new fol­low­ers and hun­dreds of new sales. The GREAT news is that it DOES work. It’s been proven again and again that a huge piece of today’s mar­ket­ing IS social media mar­ket­ing. The pri­ma­ry ben­e­fits are: Increased expo­sure, increased traf­fic, mar­ket­place insight, lead gen­er­a­tion, devel­op­ing loy­al fans, improved search rank­ings (SEO), busi­ness part­ner­ship growth, reduced mar­ket­ing expens­es and increased sales. I per­son­al­ly have found this to be true. Most peo­ple start to see results in about 6 months, and start to meet their larg­er goals in 12 — 24 months. So, this is my “please remem­ber to be patient” love note for you. But wait…Isn’t there a way to speed this up?? Pour some gaso­line on this baby?? 1. No…and YES!!! There is noth­ing as proven as time to let things grow. But there is also noth­ing like well-craft­ed social media ads to light a fire under it! Social media ads can be run on almost any plat­form, for almost any bud­get. In addi­tion to offi­cial ads, there are also less expen­sive “post boosts” on Face­book. 2. Mea­sure­ment, analy­sis and improve­ment. I also rec­om­mend con­sis­tent­ly look­ing at all your KPI’s (key per­for­mance indi­ca­tors) to see what you can do to get bet­ter results. Look at the opti­mal days for your posts, the opti­mal times of day to post, which of your posts get the most engage­ment, etc. 3. Con­sis­ten­cy. Part of this social media game is just PLAYING. Well-craft­ed, key­word-rich posts, put out across mul­ti­ple plat­forms every week DO get results. When you’re con­sis­tent with your social media and using best-prac­tices, suc­cess is inevitable.